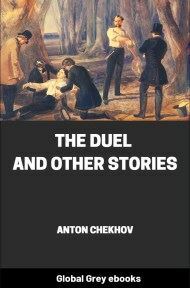 This is Volume 12 of The Tales Of Chekhov and includes 25 stories including A Classical Student, Vanka, Grisha, The Dependents, A Chameleon, A Day In The Country, In Passion Week, The Bird Market, and The Old House. GRISHA, a fat, solemn little person of seven, was standing by the kitchen door listening and peeping through the keyhole. In the kitchen something extraordinary, and in his opinion never seen before, was taking place. 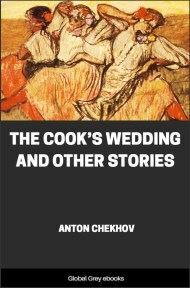 A big, thick-set, red-haired peasant, with a beard, and a drop of perspiration on his nose, wearing a cabman's full coat, was sitting at the kitchen table on which they chopped the meat and sliced the onions. He was balancing a saucer on the five fingers of his right hand and drinking tea out of it, and crunching sugar so loudly that it sent a shiver down Grisha's back. 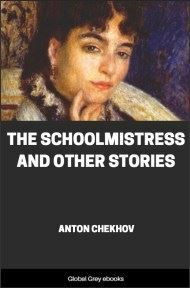 Aksinya Stepanovna, the old nurse, was sitting on the dirty stool facing him, and she, too, was drinking tea. Her face was grave, though at the same time it beamed with a kind of triumph. Pelageya, the cook, was busy at the stove, and was apparently trying to hide her face. And on her face Grisha saw a regular illumination: it was burning and shifting through every shade of colour, beginning with a crimson purple and ending with a deathly white. She was continually catching hold of knives, forks, bits of wood, and rags with trembling hands, moving, grumbling to herself, making a clatter, but in reality doing nothing. She did not once glance at the table at which they were drinking tea, and to the questions put to her by the nurse she gave jerky, sullen answers without turning her face. 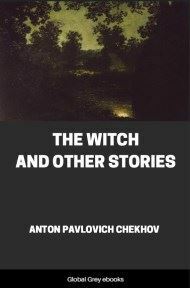 "Help yourself, Danilo Semyonitch," the nurse urged him hospitably. "Why do you keep on with tea and nothing but tea? You should have a drop of vodka!" And nurse put before the visitor a bottle of vodka and a wine-glass, while her face wore a very wily expression. "I never touch it. . . . No . . ." said the cabman, declining. "Don't press me, Aksinya Stepanovna." "What a man! . . . A cabman and not drink! . . . A bachelor can't get on without drinking. Help yourself!" The cabman looked askance at the bottle, then at nurse's wily face, and his own face assumed an expression no less cunning, as much as to say, "You won't catch me, you old witch!" "I don't drink; please excuse me. Such a weakness does not do in our calling. A man who works at a trade may drink, for he sits at home, but we cabmen are always in view of the public. Aren't we? If one goes into a pothouse one finds one's horse gone; if one takes a drop too much it is worse still; before you know where you are you will fall asleep or slip off the box. That's where it is." "And how much do you make a day, Danilo Semyonitch?" "That's according. One day you will have a fare for three roubles, and another day you will come back to the yard without a farthing. The days are very different. Nowadays our business is no good. There are lots and lots of cabmen as you know, hay is dear, and folks are paltry nowadays and always contriving to go by tram. And yet, thank God, I have nothing to complain of. I have plenty to eat and good clothes to wear, and . . . we could even provide well for another. . ." (the cabman stole a glance at Pelageya) "if it were to their liking. . . ."
Grisha did not hear what was said further. His mamma came to the door and sent him to the nursery to learn his lessons. "Go and learn your lesson. It's not your business to listen here!" When Grisha reached the nursery, he put "My Own Book" in front of him, but he did not get on with his reading. All that he had just seen and heard aroused a multitude of questions in his mind. "The cook's going to be married," he thought. "Strange—I don't understand what people get married for. Mamma was married to papa, Cousin Verotchka to Pavel Andreyitch. 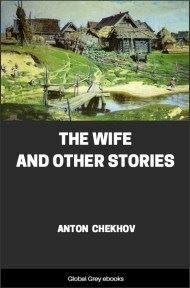 But one might be married to papa and Pavel Andreyitch after all: they have gold watch-chains and nice suits, their boots are always polished; but to marry that dreadful cabman with a red nose and felt boots. . . . Fi! And why is it nurse wants poor Pelageya to be married?" When the visitor had gone out of the kitchen, Pelageya appeared and began clearing away. Her agitation still persisted. Her face was red and looked scared. She scarcely touched the floor with the broom, and swept every corner five times over. She lingered for a long time in the room where mamma was sitting. She was evidently oppressed by her isolation, and she was longing to express herself, to share her impressions with some one, to open her heart. "He's gone," she muttered, seeing that mamma would not begin the conversation. "One can see he is a good man," said mamma, not taking her eyes off her sewing. "Sober and steady." "I declare I won't marry him, mistress!" Pelageya cried suddenly, flushing crimson. "I declare I won't!" "Don't be silly; you are not a child. It's a serious step; you must think it over thoroughly, it's no use talking nonsense. Do you like him?" "What an idea, mistress!" 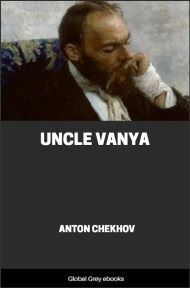 cried Pelageya, abashed. "They say such things that . . . my goodness. . . ."